Saint Cassian the Greek of Uglich, in the world Constantine, was a descendant of the Greek Mangupa princes. In 1478 he arrived in Moscow as part of the delegation to Great Prince Ivan III, together with the daughter of the Roman emperor, Sophia Paleologa, the future bride of Great Prince Ivan III. Having decided to devote his life to the service of God, the Constantine declined the offer to remain at the court of the Great Prince by which he would receive wealth and vast property, and he resettled near Bishop Joasaph of Rostov. When the bishop withdrew to the Therapon Monastery for solitude, Constantine followed him, and he led a strict ascetic life. He accepted monasticism after a miraculous vision by night of Saint Martinian, a former abbot of the monastery, urging him to take monastic tonsure, at which time he took the name Cassian after Saint Cassian the Roman (since he also was a Roman). 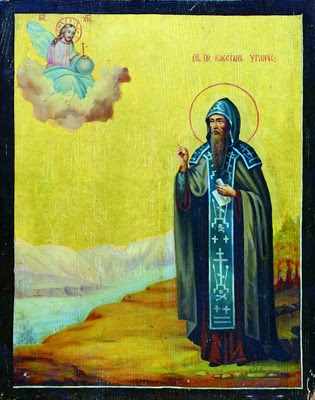 After a certain period of time, Saint Cassian left the monastery going not far from the city of Uglich, near the confluence of the Volga and Uchma Rivers, where he founded a monastery in honor of the Dormition of the Mother of God. With the help of monks from Therapon Monastery, and the permission of Prince Andrew of Uglich, he built the Church of the Dormition. Reports of the monk spread widely, and many people began to come to receive his blessing, to see the wilderness habitation and converse with him. Saint Cassian accepted everyone with love, guiding them on the way to salvation. Subsequently, during a heavy flood, when the Volga flooded, the church received significant damage. Then Prince Andrew of Uglich again came to the aid of Saint Cassian. The monastery with the church were moved to another place, not far from the former, but in a safer place. The new church was consecrated in the name of the holy prophet John the Baptist and became a parish for the nearby villages. 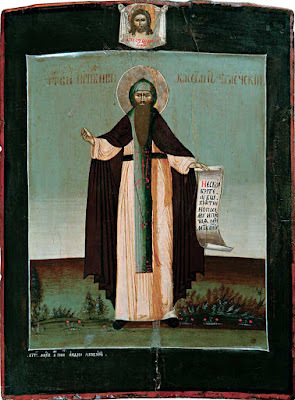 Saint Cassian for a long time labored in the monastery founded by him. The monk died in great old age on October 2, 1504. In the Uglich Chronicles many miracles of the Saint were recorded, in particular the protection of his monastery from Polish soldiers in the years 1609-1611 by his prayers. 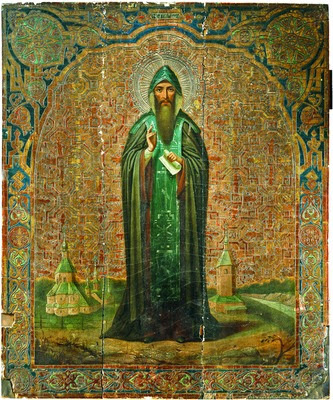 The icon of blessed Cassian was miraculously painted also. A priest named Symeon, an iconographer, made a promise to paint it, but fell into a serious illness and for two years he could not fulfill his vow. At last he came to Abbot Hermogenes and asked him: “How should draw the image of the monk?” The abbot gave him instructions on which it was written how to portray blessed Cassian. Thinking about the task he had undertaken, the priest fell asleep and saw in a dream the face of the Saint inscribed on the board he had prepared, similar to the instructions given to him. In the eighteenth and nineteenth centuries, on the peninsula where the Kassianov Uchemsky Monastery was once located, two stone churches of the Dormition of the Theotokos and Nativity of John the Baptist and the bell tower were built. In the first was the tomb of Saint Cassian. In the late 1930's, the monastery was blown up by the Communists. Now only three hills towering over the Volga and the cross and the chapel, set up by local Myshkin lore historians, remind one of this lost center of medieval culture. 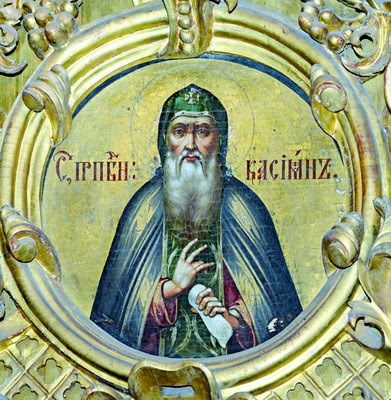 The memory of Saint Cassian of Uglich is celebrated also on May 21, the day he shares with his namesake, the holy Emperor Constantine the Great.